Well my determination to make and preserve time for art this year did not get off to a flying start in January. I have been solo parenting since the beginning of the year and then I came down with some gnarly virus that caused me to have a fever for three days. That illness, however, meant I had to take a couple of days off work to recover and recuperate when I was fit for nothing that could not be done on the sofa. I, therefore, put together something in my art journal. I used an Art Journal Adventure prompt – Food – as my inspiration. 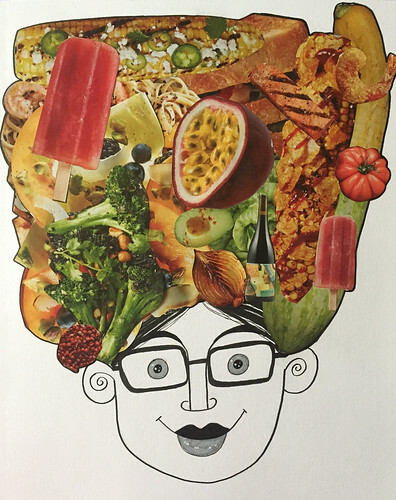 I love cooking and eating so I decided to construct a simplified self-portrait which then combined with a Carmen Miranda type headdress composed of clippings of magazine photos of food. It’s a very simple page, quick and easy to put together, but it was good food for the soul to actually do something creative when I was feeling so gross. This is pretty funny. You have the most creative fun mind. Hope you are better in the feel department. Thanks. I’m back at work today and managing just fine. Good …thats all we can hope for. That’s a delightful piece! I hope you’re feeling much better now! Thank you. I’m on the mend now. Unfortunately the 11 year old is down with the same weird thing now. Goodness. Glad you are on the mend and hopefully your 11 year old will be soon too. Yes, thank you. The kids and I are all well on the road to recovery. It’s Mr Pict who is down with it now. We can’t wait to be an epidemic free household. Goodness! Glad you and the kids are recovering well. Here’s sympathy and get-well-soon wishes for Mr. Pict. Glad you are recovered. And love the food head lady! Thank you! I’d say recovering rather than recovered but I’m on my way. It’s really just a standard winter virus but with fever as a symptom. I’d certainly take it over flu. That is brilliant! Glad you are starting to feel better. Thank you. The bitter cold meant work was closed today and I got to stay home. Hopefully an extra day of rest will help my recovery. I hate winter. So do I, even though ours isn’t as bad. Roll on Spring! Thank you. I am feeling much better now. I hope you all fully recover from the illness. Thank you. Yes, I am completely recovered now. Thank you for your appreciation. More grease to your literarily greased elbows. I love your creativity in art but also in your voice in your blog. Thank you so much for that. That’s such a lovely compliment.